Sweet- Because Easter Should Be Sweet! Colors are prettier in person than they appear here! And not just for babies! The little P.S. I Love You tag makes it even sweeter! This quilt is made with the same intention as my aprons -to be used! Very nicely made quilt is machine pieced, machine quilted and machine stitched binding. No need to treat with kid gloves. Use it, wash and dry it, use it some more! What good is a quilt if it can’t be loved? The last picture shows how the quilt will look after washing- these little quilts get softer and crinkled with each wash! Simple 35”x45” patchwork quilt shows off sweet vintage and current prints from my collection. Backing is a pretty blue spatter dot - maybe Easter Egg dye?, and the quilt is finished off with a cotton candy bias stripe. Batting is Hobbs 80/20 Heirloom Batting. 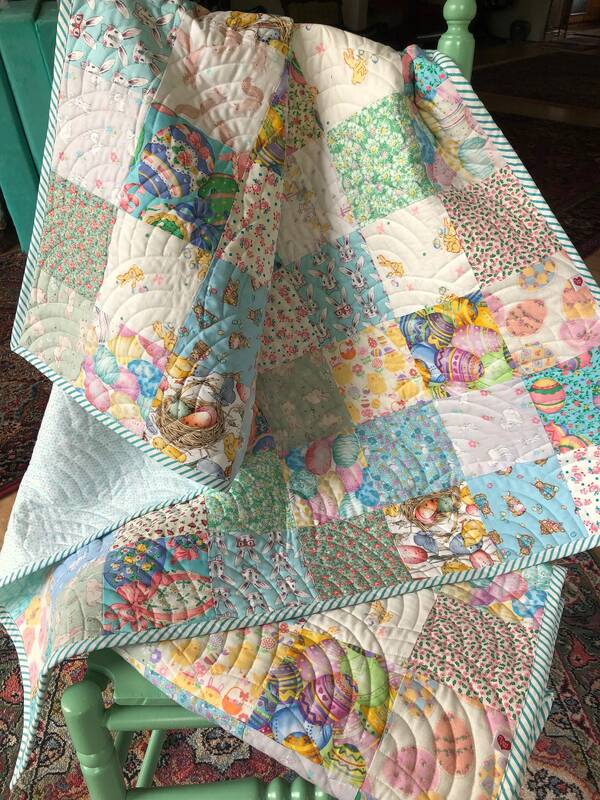 I machined quilted it using the well loved Baptist fan design. If you have any questions, please let me know. I will ship this in a legal flat rate envelope as the most economical way. I also combine shipping whenever possible. Contact me for international shipping cost.